Who ‘deleted’ mighty Lalu from political frame? 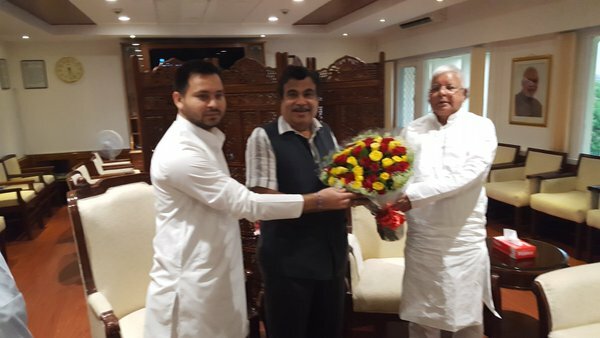 PATNA: On April 19, Bihar’s deputy chief minister Tejashwi Prasad Yadav accompanied with his father RJD chief, Lalu Prasad called on Union Road Transport and Highway Minister Nitin J Gadkari at latter office at Transport Bhawan, Parliament Street, New Delhi to discuss some important issues. The very next day, Tejashwi tweeted, “Met Central Minister Sh. Nitin Gadkari Ji regarding road & bridge projects in Bihar. Committed for development” while also sharing a photograph showing him and his father jointly presenting a bouquet to Gadkari. However, the photographs of their meeting issued to the Press later found Lalu strangely missing from the photo frame. Who deleted Lalu’s photo from the frame? Both the BJP and the JD-U have gone on putting blame on each other, adding a curious twist to the whole story. “Lalu is a bigger leader in stature than Gandkari’s and his disregard is, s such, a disregard to the people of Bihar,” remarked JD-U general secretary KC Tyagi claiming the said release was issued by Gadkari office. “We appeal Laluji to meet only the leader matching his stature only,” Tyagi added while talking to the media . The BJP was quick to make a counter attack saying Lalu’s image was deleted by the people in the Nitish Kumar government as the said Press release was issued by the state Information and Public Relations Department . “A chief minister with only 71 legislators has now begun down-sizing the leader with 80 MLAs. This is indeed strange,” quipped former Opposition leader Nand Kishore Yadav of the BJP.